Guillon Theatre | Pilchner Schoustal International Inc. 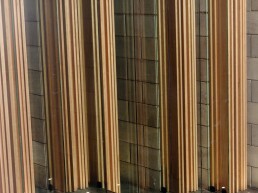 This theatre is the end result of a design approach that embraced acoustic rationalism and the use of natural materials as the departure point. 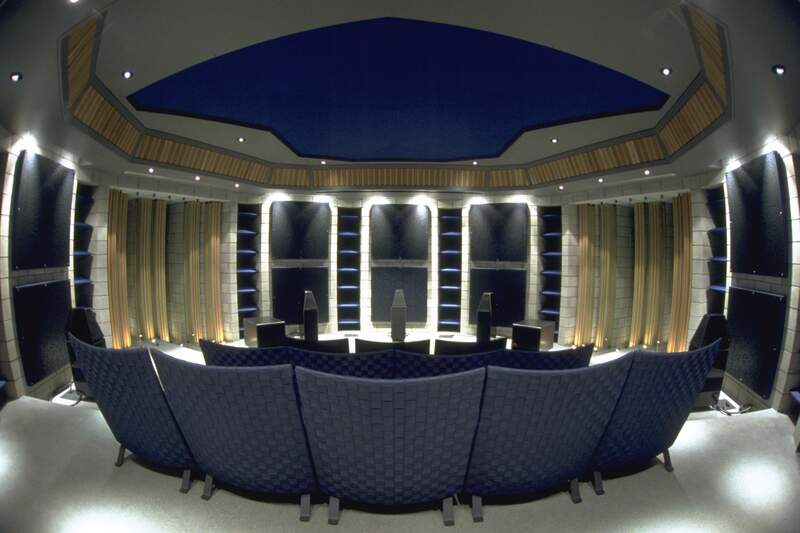 It was designed by Pilchner Schoustal International as a response to a Toronto client whose interest was in developing a theatre space as acoustically accurate as possible for the purposes of surround sound reproduction. The look of the room was derived from the acoustic program with an unusual material palette consisting of polished black concrete floors, solid concrete block walls, wood, steel, aluminum, and glass. The approach is as follows. When examining the context of a surround environment, it is evident that the five main channels are oriented in different directions. We assumed that to provide accurate and matched reproduction from these channels, the acoustic environment would have to be similar along each speaker axis. By extension, we concluded that how the speakers were coupled to nearby boundary surfaces, and how the directivity was loaded into opposing surfaces would have to be matched to expect matched reproduction. 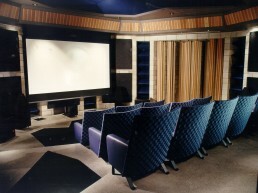 This lead to a specific approach to room geometry which began with placing an identical wall of given size at a fixed distance behind each speaker so as to match boundary effects. 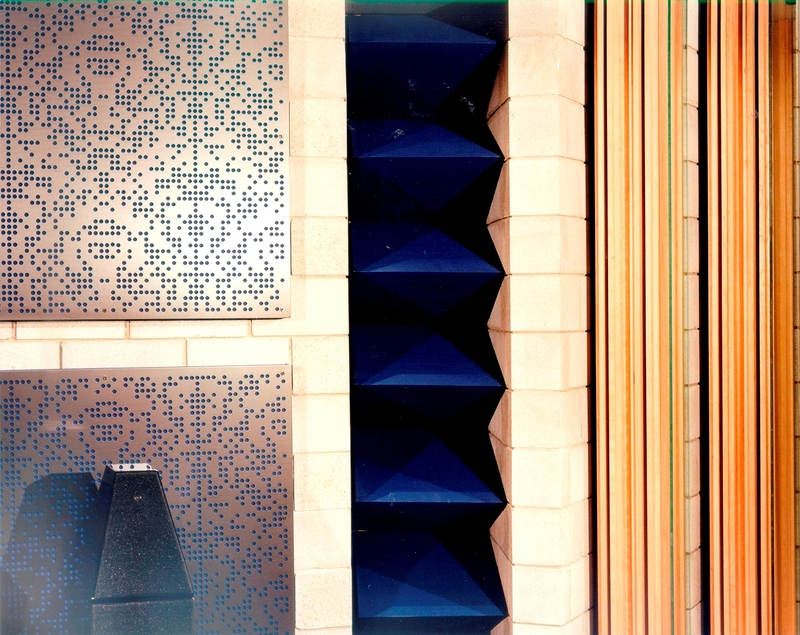 Next, to achieve matched room loading, custom made RPG diffractals were embedded into the room shell on the rear wall, and both side walls between the front and rear speakers. 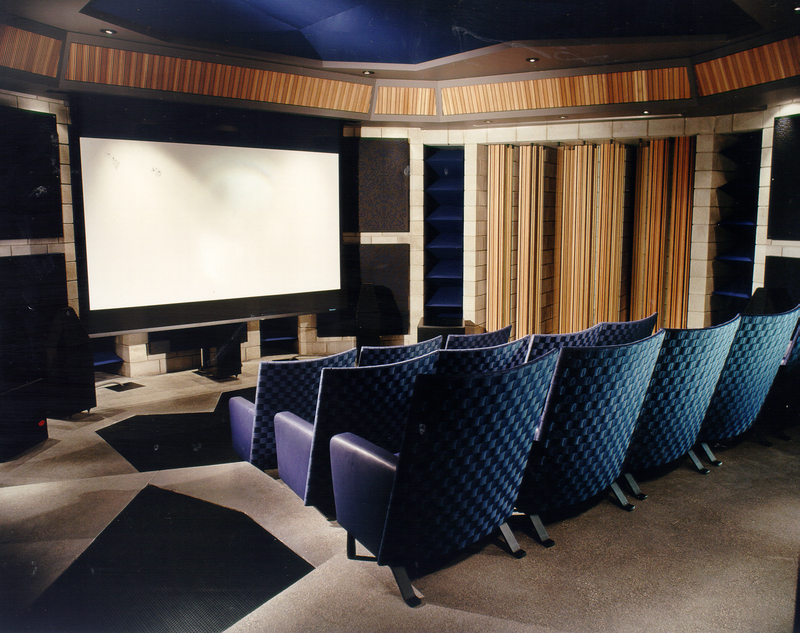 In this way each speaker is directed into a wide band diffusor on its opposing room surface. The RPG diffractals consisted of custom modulation of the room shell geometry and RPG opti-step diffusors made with cherry wood. As this approach yields a geometry which begins to approximate a circular plan, each room corner incorporates a custom built low frequency trap to control modal conditions. This trap consists of a 12″ deep composite diaphragmatic panel with surface mounted 3′ deep anechoic wedges. 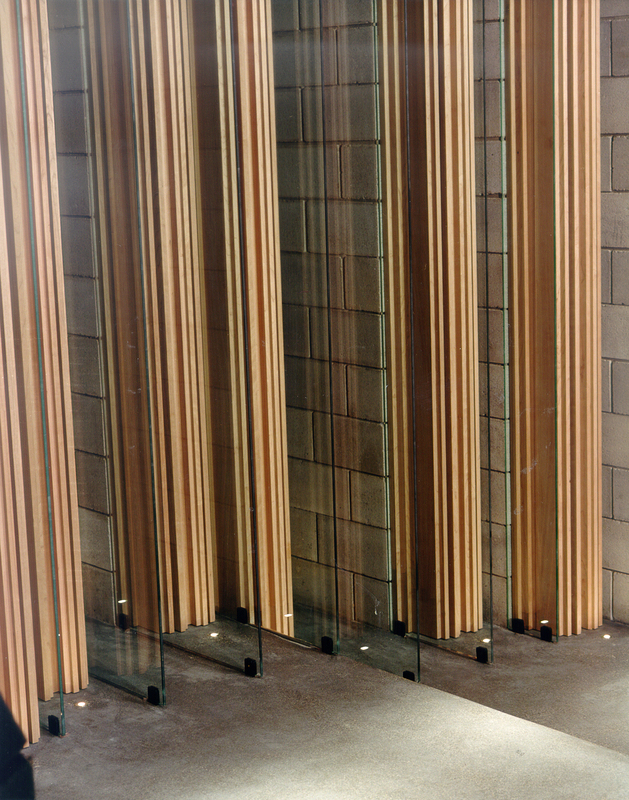 To control specular reflection within the space, custom made RPG Bad Panels were applied to the wall surfaces. 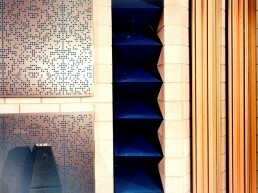 These panels were 3″ thick and incorporated a brushed black anodized aluminum reflection mask custom manufactured by RPG. The concrete floor surface also received 2 foot deep absorptive traps covered with heavy gauge perforated steel, with geometry derived from the speaker directivity. This geometry is also matched with an 18″ deep ceiling trap. 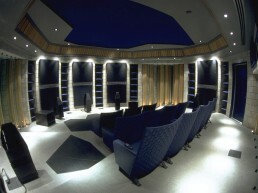 These surfaces control all specular reflections from the floor and ceiling between the speakers and the listening area. The space is hydronically heated through the concrete floor slab. Cooling is provided by an integrated air-conditioning system. The duct work for the air handling is contained in a ceiling perimeter bulkhead. The surfaces of the bulkhead are treated with RPG Flutter-Free of solid cherrywood. The execution of the plan was masterfully carried out by the contractor Arcademia Group. Each aspect of the construction was closely monitored and built with an overall tolerance of less that 3/16″. The complex room geometry was constructed of solid concrete block with all necessary mitres cut by the manufacturer. As the block wall was the finish surface, the workmanship had to meet exacting standards in placement and finish quality. Upon testing the acoustic performance of the end result, we note that the decay time within the space is a uniform 0.43 seconds across eight octave bands. 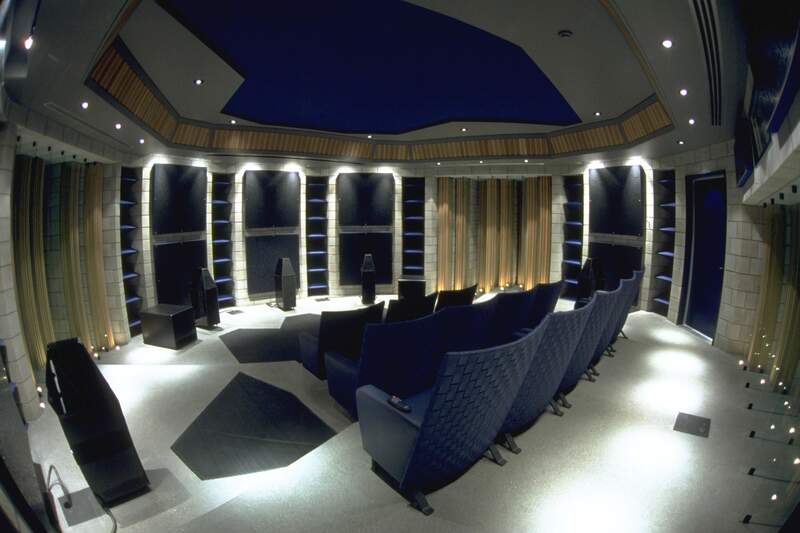 All specular reflections are down -15 dB from each speaker location to the listening area. The frequency response of each speaker is within 2 dB of each other. Subjectively, the sound performance is impressive. The RPG diffractals do a masterful job of reducing the wide band specular energy and filling the listening area with a uniform diffuse sound field. 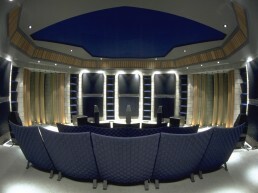 All twelve seats sound identical, with even response and excellent sound stage development. The surround envelopment is very immersive. The client, an experienced audiophile, is absolutely thrilled with the outcome.